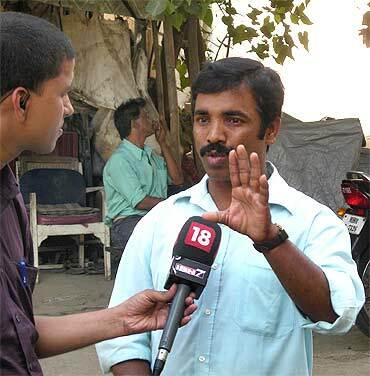 Ajmal Kasab may have been sentenced to death, but slain cop Tukaram Omble's family is still coming to terms with the loss. Abhishek Mande was at Omble's home, sharing the grief. A balding man in his late forties wearing a khaki uniform -- that is what a hero looks like. 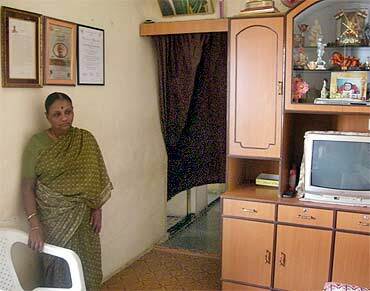 The photograph of late Tukaram Omble, the braveheart cop who single-handedly caught Ajmal Kasab, stands in something of an altar of a one-bedroom apartment in Mumbai's police quarters. At the other end of the room, an old television set is placed in a shelf. You would have expected it to be switched on. It isn't. Omble's wife Taramati likes it that way. She is aware that her husband's killer will be sentenced on Thursday and has held herself together spectacularly well. "I don't want to talk about it," she says politely, but firmly. Promise her you won't ask anything about the case and she offers you a glass of water, makes you comfortable. If it were any other day, she'd probably have made you some tea. Not today. At the Omble residence, it is just another day. The grandson -- six-year-old Harshu -- has his vacations and is visiting his maternal grandmother. The little fellow scampers in and out of the house -- once to fetch a cricket ball, on another occasion to pull out some board games and then (much to his grandmother's horror) pencil cells. Why he needs them is beyond Taramati's understanding. You get the feeling she's stopped trying to make sense of what is going around her husband's death. She wouldn't have imagined it when Tukaram stepped out the house that it'd be the last time she would see him. If Tukaram's death was not bad enough, there was the imminent media glare that followed almost immediately. Every news channel and paper wanted a piece of her: a quote on how she 'felt' and what was her 'first reaction'. "What can you tell them?" she asks almost defeated, "You let one person in and the rest will follow. Then they spend hours adjusting the lights and cameras." There is a knock on the door. A 30-something man enters. Manoj Kamble, a family friend, has dropped by to say hello. He tells Taramati something about the new house he's purchased and how he plans to do it up. Taramati listens intently, like a mother would hear out her child. She offers some advice and then lets him talk. After a while the room falls silent again. A cool breeze blows from the Arabian Sea. You notice that a window opens to a beautiful view of the Bandra-Worli Sea Link road. It is the only window in the room. 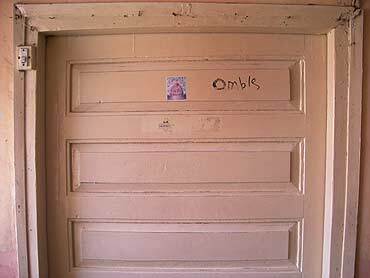 The rest are walls, most of them adorned with citations of Omble's bravery, certificates and photographs of the man. You wonder if it's a way the family is trying to fill the void he left behind when Kamble speaks out: "We owe our life to Mama." That was what Omble was called -- Mama or maternal uncle, a man who would step in whenever anyone was in difficulty and make their troubles vanish. Kamble continues, "My father and he worked together. In 1981, when was on his deathbed, Mama assured him that he'd take care of us. And he did. We were just as close to him as his children. He got my mother a job, made sure we were settled down and never let us feel that we'd lost our father." Much later, Kamble and his family were to know that Omble had an unfinished promise. "One day he came over with a prospective groom for my sister. He told us that the he was a boy from a decent family and worked with the Army." Omble'd lightened the dying man's burden by promising him that he'd get his daughter married. Next week, they will celebrate their 14th anniversary. It has been over an hour since you've stepped into their house. There seems no one else at home. "The older one has her M.Ed. examinations and the younger one has gone to work," Taramati says. She is beginning to get impatient. You are awaiting the verdict too. But there's no word yet. The clock strikes 1. It's probably lunchtime. You excuse yourself and Kamble follows. "What will you do now," you ask somewhat intrigued. Pat comes the reply: "Have lunch, put Harshu to bed and sleep for a little while." Life has crawled back to normal, except on days like this one when they are reminded of the night that took away Tukaram. Later in the evening, you visit again to share the news of the verdict. This time the television is turned on. For the first time Taramati smiles: "I know. I saw it on TV."